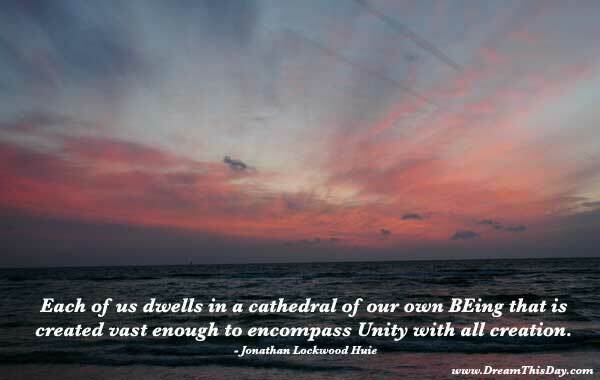 May you find great value in these quotes about unity and the oneness of all life. We all share unity with each other and with the one Creator Spirit. We are one. and all beings in his own Self, and looks on everything with an impartial eye. you will be able to live with it and affirm it, perhaps even enjoy it, as your life. and they will learn that death is stingless indeed, and as beautiful as life. Praying without ceasing is not ritualized, nor are there even words. and through compassion, to find the reality of Oneness. The reason is that the One who is present in you is present in me. this makes it possible for laws higher than the ordinary mind knows of to be revealed to him. This overcoming of all the usual barriers between the individual and the Absolute is the great mystic achievement. In mystic states we both become one with the Absolute and we become aware of our oneness. This is the everlasting and triumphant mystical tradition, hardly altered by differences of clime or creed. Only you should surrender to Him and you will rise above happiness and unhappiness. When we see the face of God we shall know that we have always known it. for you are not alone, but God is within, and your genius is within.